In 2016, there were some 11,800 planning applications for new dwellings decided by local planning authorities in London. Only a fraction of these are strategic applications that need to be referred to the Mayor. 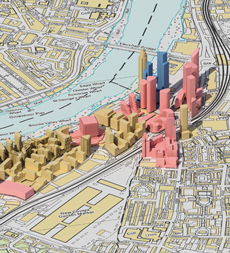 Strategic applications include schemes containing at least 150 residential units and, though relatively small in number, they make a significant contribution to net new housing supply in London. Opportunities to influence planning proposals often exist at a much earlier stage than a formal planning application. Where larger scale development is envisaged, local plans or studies of housing land may already have identified specific sites and indicated the sort of development that might be acceptable in planning terms. Sometimes the local planning authority may have issued a planning brief for a site or produced a master plan to guide the development of a particular locality. A key role for HUDU is to monitor the development of plans and proposals as they emerge (and as planning applications come forward), and to work with NHS partners to ensure their needs are taken into account during the planning process and that health benefits are optimised. What is important is not just the impact of individual developments, but the cumulative impact over time. Development activity varies considerably within and across areas, as well as over time. Regular monitoring of the progress of developments is important, as is regularly reviewing the implications of changing needs and circumstances.